As a result of market demand for NORSOK workspace modules, Ferguson Norge, specialists in the rental of DNV 2.7-1 / EN 12079 certified offshore containers, refrigeration/freezer modules, workspace modules and accommodation solutions to the global offshore energy industry, said it has expanded its NORSOK accredited range to include a enhanced series of Z-015 workshops. The range has been developed in response to customer requests for NORSOK products. The workshops have been modified to qualify for NORSOK accreditation and Ferguson Norge has already been taking orders for them. The new NORSOK workshops come in three sizes, 10 feet, 14 feet and the spacious 20 feet. They can be used for a variety of purposes, creating a safe and comfortable working environment within the harshest of climates. The units are complete with EX light and heating, EX fan and PA system. They have been fitted with a personnel door, recessed cabinet, workbench, tool board, drawer and shelves. The new workshops, and the other products, including a range of chemical and acid tanks, waste skips, and other related items, are part of Ferguson Group’s multimillion pound investment into operational capacity. This was to consolidate its place in the Northern Europe’s energy market, and follows another year of significant increased earnings for the company in which the group’s global expansion continued apace. 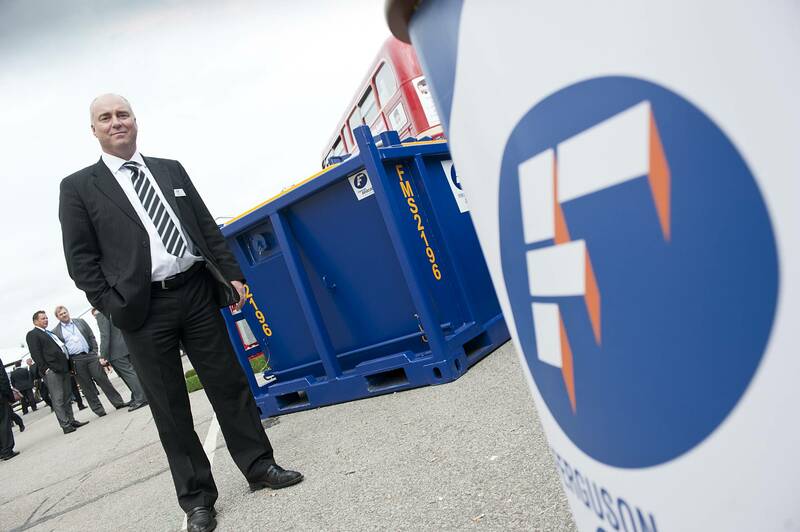 Recently, Ferguson Group’s fluid solutions range has also expanded. The range now includes acid tanks, helifuel tanks, cryogenic tanks, 20ft ISO tanks and chemical tanks. Every product has been designed and manufactured to DNV 2.7-1 / EN12079 standards and includes innovative features developed in accordance with customers’ needs.